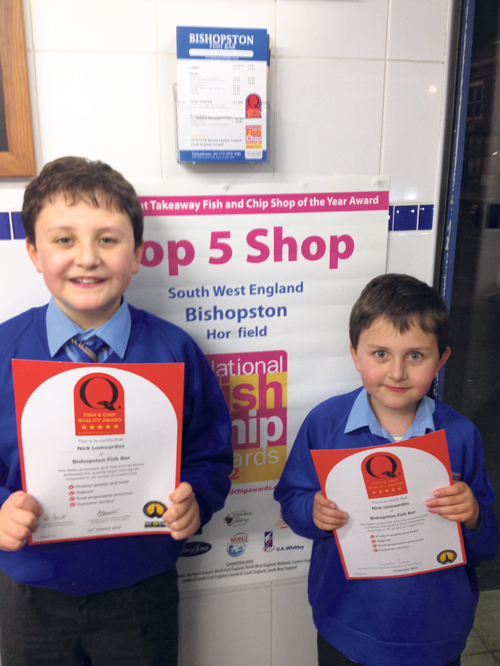 Success is a family business for Bishopston Fish Bar. Owner Nick Lomvardos has been celebrating with his sons and staff after being presented with the National Federation of Fish Friers (NFFF) Fish & Chip Quality Award. It is the fourth consecutive time that Nick has won this award since he opened his Gloucester Road Central chippy seven years ago. He said: “To be recognised as one of the top fish and chip shops by the NFFF is indeed an honour and a credit to our hardworking staff and I would like to offer my sincere thanks for their continued hard work and efforts to maintain our excellent reputation. “The award doesn't just represent the fish and chips we produce, but also the hard work and high quality produce our local suppliers provide us to work with. All our fish are cooked fresh on the day. Our potatoes are peeled and cut daily and we change our oil every week. The award identifies outlets that serve the highest quality fish and chips following a thorough assessment of the premises, equipment, working practices, hygiene standards and management controls, along with the quality and taste of cooked fish and chips. It comes shortly after the Bishopston Fish Bar made the Top 20 list of UK Independent Takeaway Fish and Chip Shop for the fourth year running. Nick’s two sons, Andrea, 14, and Andoni ,11, may be too young yet to take over the family business but they are proud to show off the latest award. The boys are keen to raise money for Alzheimer's research as their grandfather has this condition. Building on their successful charity fundraiser for Marie Curie last year when they swam 200 lengths, Andrea and Andoni are aiming to complete 500 lengths of Horfield pool this April and are hoping to raise £1,000 from the event.